the linux kernel broke support for the capacitive touch chip :( it sux, we dont have a solution. we used to try patching kernels but raspbian came out with a new one every few months, we just couldnt keep up. can you use a resistive touch? Last edited by przemo on Thu Jul 05, 2018 4:24 pm, edited 1 time in total. oh neat! ok we'll update the guide if you do! There is more in it than I thought. Looks like it works in a strange mode (absolute + relative?? ), the movement is smooth, so I thought it's OK.
Edit: It's probably because there was no TSLIB_FBDEVICE=/dev/fb1 defined. With TS_LIB_FBDEVICE the resolution is 320x240 and calibration works fine. yep - its been a few years but this sounds familiar. we dont mind compiling our own package but it would have to be a real fix! I'm currently compiling SDL2 and pygame_SDL2. 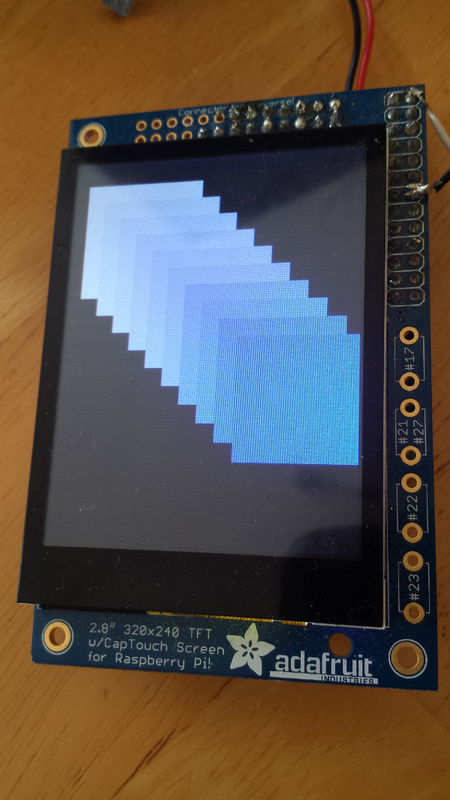 Another piece of information: python-evdev  seem to be much better way of handling touchscreen from python. And it Just Works (tm). If someone really needs pygame maybe getting touch events using python-evdev and posting them into pygame event queue with pygame.event.post would work? P.S. It's a bit off-topic, but I'm sure there are plenty of people looking for solution of the pygame & touchscreen problem and piTFT + cairo + python-evdev is a partial solution. nice, added a link here!